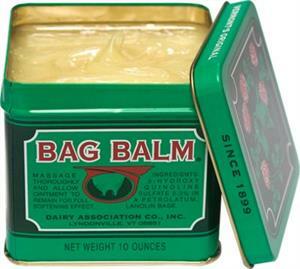 This salve was created to soften cow udders but has a whole slew of applications for humans too! Made of 8-Hydroxy Quinoline Sulfate 0.3% (antiseptic) in a Petrolatum Lanolin Base. For rough hands, chafing, cuticles, dry cracked skin, psoriasis, dry facial skin, burns, zits, diaper rash, saddle sores, sunburn, pruned trees, bedsores and more. 8oz square tin with lid.